Call me nasty, I'm back to writing letters. I guess I won't die before writing all the letters in this challenge. 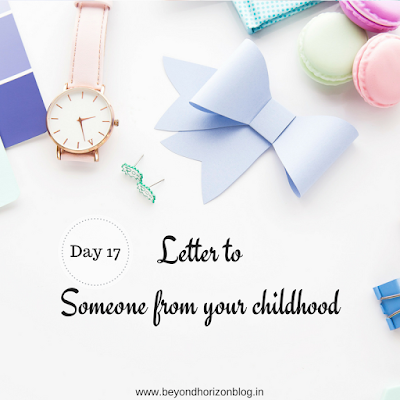 So whom do I want to write to today from my childhood? Yes, time...you are the one I want to write to from my childhood. You were not the best for me while growing up but now I do acknowledge you. Sigh! The loss teaches us so much. Being an elder child, somehow I was considered to be 'a responsible child'. I couldn't live carefree. Though now I think of you, I was blessed to have you. There are memories, millions of them stuck in you. I still remember the 4 year old me instead of playing in vacation I was practicing writing numbers and reciting them. I used to lock myself inside home only to role play of a 'teacher'. I was not a nerd but geek. 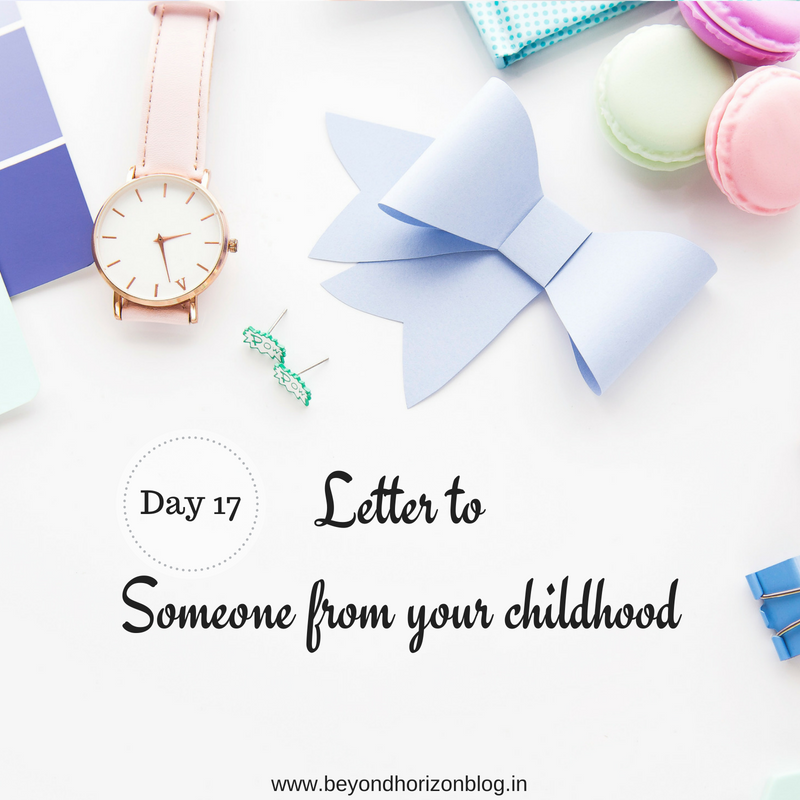 I couldn't find anything to play with or indulge in activities other than books and concentrating in studies. You will be surprised I remember the first time ever I took a leave from school in Second grade due to fever and guess what?! Even that day I was studying the lesson which I knew would be taught in school. I was jealous of my sibling but we played a lot together. Though I feel we lost a lot which could have been done. Anyways, that's life. I had stage fright but fighting with anxiety I always spoke in front of crowd and ended in ranking among top 3 speakers. I miss waking up to Talespin, Aladin on Sunday morning. I miss the tales from Potli Baba ki, Vikram and Betal, Byomkesh Bakshi, Shaktimaan (lol), and few more. And Oh! Those hindi-dubbed china television shows on Home TV. (Does anyone remember them?) I miss the tea made by mom along with the many biscuits from snacks box we had (oh, we still have that). I wasn't emotionally close to anyone and it might sound rude but I am thankful for it. Because I wouldn't have handled all the losses while growing up, with the ups and downs of life. I did not take care of myself growing up when I had you, time. There is so much to miss, so many memories, all in all lessons learned.